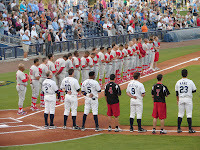 The Game: With a packed house and owner Cal Ripken in attendance, the Charlotte Stone Crabs began their title defense in winning fashion by defeating the Palm Beach Cardinals 4-2 on Opening Day at Charlotte Sports Park. The Stone Crabs took the lead early in the second inning on a solo home run by Matt Sweeney to give the Stone Crabs a 1-0 lead. Palm Beach tied the game in the third inning. Chris Swauger doubled to right field. Tony Cruz then singled to left, scoring Swauger to tie the game 1-1. The game would remain tied until the bottom of the fourth when the Stone Crabs struck for two runs. Matt Sweeney led off the inning with a walk, then advanced to second on a wild pitch. Jake Jefferies singled to right, moving Sweeney to third and giving the Stone Crabs runners on the corners. Michael Sheridan drove home the go ahead run with a double to right that scored Sweeney. Jefferies later scored on sac fly by Reid Fronk to give the Stone Crabs a 3-1 lead. The Cardinals pulled to within a run of the lead in the sixth inning. Osvaldo Morales, Richard Racobaldo and Xavier Scruggs delivered consecutive singles to load the bases with one out. Morales scored on a wild pitch by Dane De La Rosa. But De La Rosa recovered to strike out the remaining two hitters and get out of the inning with the lead intact 3-2. The Stone Crabs posted an insurance run in the bottom of the eighth inning. Kyeong Kang drew a walk to lead off the inning. Henry Wrigley followed with an RBI double to left, scoring Kang and giving the Stone Crabs a 4-2 opening day victory, first in franchise history. Matt Moore made the start, pitching 3 innings and allowing 1 run on 4 hits with 4 strikeouts and a walk. Marquis Fleming earned the win, pitching 2 shut-out innings and allowing 1 hit and 4 strikeouts. Dane De La Rosa and Neil Schenk each pitched an inning and recording holds with De La Rosa giving up a run. Zach Quate recorded the save, tossing the final two frames and allowing 1 hit and 2 strikeouts. Brian Broderick was the losing pitcher for Palm Beach. Stone Crabs Player of the Game: Matt Sweeney; contributed for two of the Stone Crabs runs and went 2 for 3 with a home run and a double. Jake Jefferies: 1 for 4 with a run scored. Kyeong Kang: 3 for 3 with a run scored and a walk. Matt Moore: 1 run on 4 hits with 4 K's and a walk in 3 innings. Matt Sweeney: 2 for 3 with a double, home run and 2 runs scored. A Look Ahead: The Stone Crabs (1-0) will take on the Palm Beach Cardinals (0-1) in game two of the series at Charlotte Sports Park. Nick Barnese (0-0) will start for the Stone Crabs facing Jared Bradford for Palm Beach.